The UW Department of Family Medicine and Community Health (DFMCH) graduated 44 new family physicians from its sponsored and academic partner residency programs in 2018. Of them, 31 (71 percent) stayed in Wisconsin, either for direct practice or fellowships. Congratulations to all the new grads! Find out below where they’re practicing. 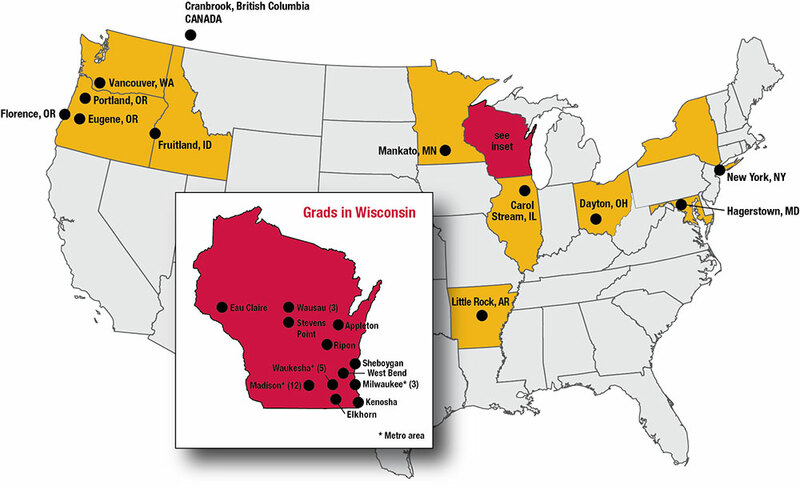 Of the 44 residents who graduated from the DFMCH’s sponsored and academic partner residency programs in 2018, 31 (71 percent) entered practice in Wisconsin. Both Baraboo graduates entered practice in Wisconsin. Mathew Herbst, MD, is at SSM Health Dean Medical Group in Waunakee, and Paul Stevens, MD, is at ThedaCare Physicians Appleton North in Appleton. Eau Claire graduate Michael Albano, DO, is now practicing at OakLeaf Clinics Pine Grove Family Medicine in Eau Claire. His classmate Amy Jo Sorenson, DO, MBA, is in nearby Minnesota, at Mankato Clinic. Krissi Danielson, MD, and Michael Dawson, MD, are on the West Coast. Dr. Danielson is practicing at PeaceHealth Medical Group in Florence, Oregon, and Dr. Dawson is practicing at Associates Medical Clinic in Cranbrook, British Columbia, Canada. One at the Aurora Lakeland Rural Training Track Family Medicine Residency (Lauren Walsh, MD, MPH). Primary Care Sports Medicine (Matthew Brown, MD). The three residents leaving Wisconsin are entering practice in Illinois (Lydia Chen, MD, Amita Health Medical Group in Carol Stream); Oregon (Divneet Kaur, MD; Mid County Health Center, Multnomah Public Health Department in Portland); and New York (Mukund Premkumar, MD, City MD Columbus Circle in New York City). One at Ascension St. Michael’s Hospital in Stevens Point (Sean Huff, DO). Rose Griffin, MD, will practice at Meritus Family Medicine in Hagerstown, Maryland. One at ProHealth Medical Group (Christopher Peters, DO, in Sussex). Of the four who are leaving Wisconsin, one is in Ohio (Jonathan Blaza, MD, at Kettering Health Network in Dayton) and three are in the West (Scott Chandler, DO, at PeaceHealth Sports Medicine Fellowship in Vancouver, Washington; Devin Lee, MD, at PeaceHealth Medical Group in Eugene, Oregon; and Caleb Patee, DO, at St. Alphonsus Medical Group in Fruitland, Idaho). Practice plans for the remaining resident, who will graduate off-cycle, are not yet finalized. One at UW Health (Lauren Mixacki, MD, in Sun Prairie). One graduate (Christina Lyon, DO) is practicing at the Little Rock AFB Family Health Clinic in Little Rock, Arkansas.